See in Glossary graphics, it is convenient to work with a separate texture file for each character. However, a significant portion of a sprite texture will often be taken up by the empty space between the graphic elements and this space will result in wasted video memory at runtime. For optimal performance, it is best to pack graphics from several sprite textures tightly together within a single texture known as an atlas. Unity provides a Sprite Packer utility to automate the process of generating atlases from the individual sprite textures. See in Glossary so that the user needs to do no manual assignment. The atlas can optionally be packed on entering Play mode or during a build and the graphics for a sprite object will be obtained from the atlas once it is generated. 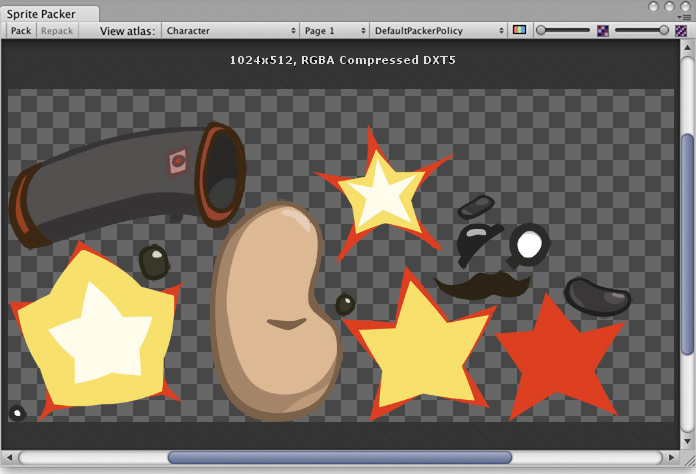 Users are required to specify a Packing Tag in the Texture Importer to enable packing for Sprites of that Texture. See in Glossary, then select the Editor category). The sprite packing mode can be changed from Disabled to Enabled for Builds (packing is used for builds but not Play mode) or Always Enabled (packing is enabled for both Play mode and builds). If you open the Sprite Packer window (menu: Window > 2D > Sprite Packer) and click the Pack button in the top-left corner, you will see the arrangement of the textures packed within the atlas. See in Glossary outline and it also defines the area used for tight packing. See in Glossary at the top of the Sprite Packer window has a number of controls that affect packing and viewing. The Pack buttons initiates the packing operation but will not force any update if the atlas hasn’t changed since it was last packed. (A related Repack button will appear when you implement a custom packing policy as explained in Customizing the Sprite Packer below). The View Atlas and Page # menus allow you to choose which page of which atlas is shown in the window (a single atlas may be split into more than one “page” if there is not enough space for all sprites in the maximum texture size). The menu next to the page number selects which “packing policy” is used for the atlas (see below). At the right of the toolbar are two controls to zoom the view and to switch between color and alpha display for the atlas. See in Glossary settings will be grouped into the same atlas where possible. DefaultPackerPolicy will use rectangle packing by default unless “[TIGHT]” is specified in the Packing Tag (i.e. setting your packing tag to “[TIGHT]Character” will allow tight packing). TightPackerPolicy will use tight packing by default if Sprite have tight meshes. If “[RECT]” is specified in the Packing Tag, rectangle packing will be done (i.e. setting your packing tag to “[RECT]UI_Elements” will force rect packing). TightRotateEnabledSpritePackerPolicy will use tight packing by default if Sprite have tight meshes and will enable rotation of sprites. If “[RECT]” is specified in the Packing Tag, rectangle packing will be done (i.e. setting your packing tag to “[RECT]UI_Elements” will force rect packing). OnGroupAtlases - implement your packing logic here. Define atlases on the PackerJob and assign Sprites from the given TextureImporters. See in Glossary the Sprite. Custom policies can override this and instead use tight packing. Repack button is only enabled when a custom policy is selected. OnGroupAtlases will not be called unless TextureImporter metadata or the selected PackerPolicy version values change. Use Repack button when working on your custom policy. Sprites can be packed rotated with TightRotateEnabledSpritePackerPolicy automatically. SpritePackingRotation is a reserved type for future Unity versions. Atlases are cached in Project\Library\AtlasCache. Deleting this folder and then launching Unity will force atlases to be repacked. Unity must be closed when doing so. Atlas cache is not loaded at start. All textures must be checked when packing for the first time after Unity is restarted. This operation might take some time depending on the total number of textures in the project. Only the required atlases are loaded. Default maximum atlas size is 2048x2048. See in Glossary values and then do compression on the atlas. private const uint kDefaultPaddingPower = 3; // Good for base and two mip levels. // Use Compression Quality for Grouping later only for Compressed Formats. Otherwise leave it Empty. // TightPackerPolicy will tightly pack non-rectangle Sprites unless their packing tag contains "[RECT]".